Collinwood 1984—Barnabas’ family (and, bizarrely, the suave and evil warlock Nicholas Blair) has summoned his spirit from 1971 to deliver a dire warning. You see, 1984’s Barnabas and his cabal of the undead are preparing to take Collinwood by force. Read on in the Major Spoilers review. Previously, in Dark Shadows: Collinwood is heading down a dark path that will not end well for those who live there. There’s a cult meeting in the basement of the Blue Whale, David’s girlfriend is a newly minted nosferatu and now the boy knows Quentin’s secret. Only Barnabas can set right what once went wrong . This issue ticked a number of boxes for me. Lots of evil vampires? Check. Time travel? Absolutely. Quentin wolfing out? Yes, please. There’s also a lot of action and fighting, which are unexpected treats in any “Dark Shadows” issue. I really enjoyed reading this. Boiled down, the story involves Barnabas’ spirit being summoned about 13 years into the future so his family can warn him of Collinwood’s imminent fall and hopefully guard against his. Quentin, Elizabeth, et al were able to accomplish this thanks to Nicholas Blair, a powerful warlock and sometimes-ally of Angelique. During his trip to the future, Barnabas’ soul inhabits the recently deceased body of Sheriff Willet; presumably because a limitation on the summoning incantation Barnabas only has about 30 minutes until he’s sucked back to 1971. Normally I imagine this would be more than enough time to warn someone about an impending doom and give them enough information to stop it, but this is cut short when the Collinwood is overrun turning the story into a run-and-fang bite-em-up throughout the house. And, as usual, it’s mainly Willie’s fault. Everyone has a chance to shine in this story, especially Elizabeth, who’s usually relegated to human furniture in almost every scene because, in 1971, she’s ignorant of the supernatural doings going on all around her every day. Her big scene shows the dignity and steely determination we all knew she had, but never had a chance to display. Nicholas Blair is one of my favorite characters from “Dark Shadows” canon, and I was thrilled to see him in this issue and double happy to see that he’s being set up for a bigger role in the story to come. He’s such a smooth warlock/demon/maybe-actually-the-Devil and always adds some thick, supernatural sleaze and sartorial splendor to any panel in which he makes an appearance. The last time I read an issue of “Dark Shadows” drawn by Nacho Tenorio I wasn’t a fan of his art style—Barnabas looked like Don Knotts in his eponymous episode of “The New Scooby Doo Movies”—and my heart sank when I realized he’d done this one as well. As it turns out, however, the situation is much improved. There’re still a few objectively odd aspects of the issue’s art—wrong angles on facial features here and there—but it’s sporadic and only once took me out of the story. Everything in this issue is going on in the dark, as it should be. 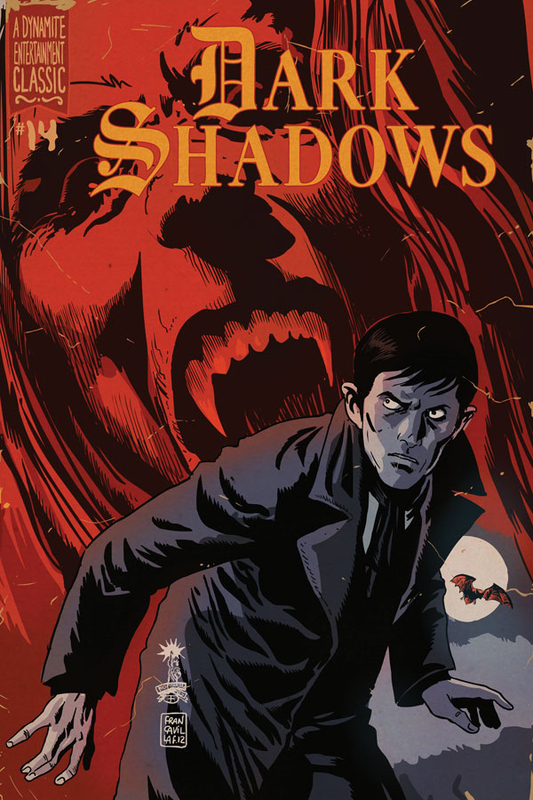 If the shadow work on “Dark Shadows” were anything less than amazing, the issue would stand a chance of being a failure, but Tenorio’s work stood no chance of that this outing. It’s not haunting, but it absolutely adds a richness to the storytelling. Recently I had gotten tired of “Dark Shadows” and even skipped the past couple of issues, but this one’s reinvigorated me and the next few issues promise to have some good action coming up. As always, this series is an acquired taste, so you may have to try a few issues to really get the flavor, but you’ll probably enjoy it if light Gothic horror is your thing. Dark Shadows #14 earns 4 stars.